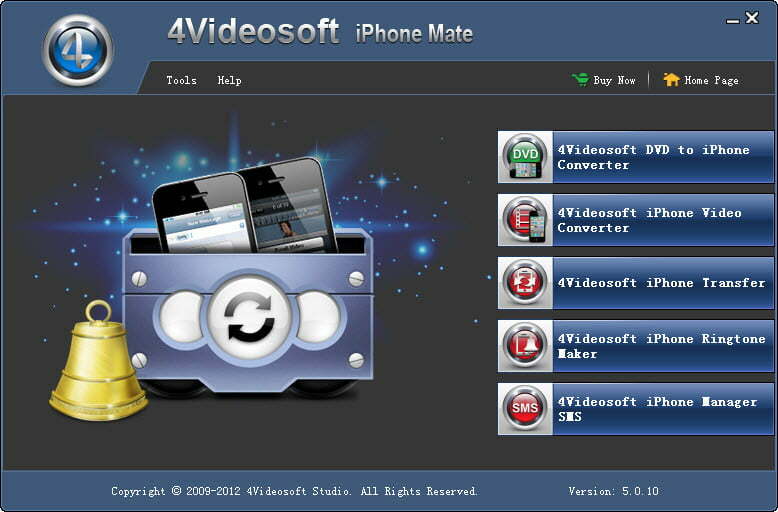 4Videosoft iPhone Mate 5.0.36 無料ダウンロード - Convert DVD/video to iPhone, transfer files between iPhone and computer. 4Videosoft iPhone Mate is a professional software with five professional iPhone tools: DVD to iPhone Converter, iPhone Video Converter, iPhone Transfer, iPhone Manager SMS and iPhone Ringtone Maker. With 4Videosoft iPhone Mate, you can easily convert any popular DVD and video file to iPhone video and audio formats, transfer files between iPhone and computer, transfer iPhone SMS (MMS) and contacts to computer for backup, and make iPhone ringtone easily. Moreover, it highly supports all Apple devices. Now it is compatible with latest iOS and iTunes. This 4Videosoft iPhone Mate can help you to convert any DVD, video and audio file to iPhone compatible video and audio formats, like MP4, MOV, M4V, MP3, AAC, M4A, etc. freely. You also can optimize the DVD and video effect with the powerful editing features. The iPhone Mate software allows you to make iPhone ringtone from any DVD, video and audio file. You can also trim the ringtone length, adjust the ringtone volume and fade-in/fade-out effect. The iPhone Mate software is the best choice for you to transfer video, audio, photos, etc. from iPhone to computer and iTunes directly. With the iPhone Transfer software, you can also add local computer files to iPhone for enjoyment. The iPhone Manager SMS can help you transfer and backup your iPhone SMS (MMS) and contacts to iPhone and manage them in the local file. Except for adding watermark, you can also adjust the DVD/video brightness, contrast, saturation, volume and hue for better effect. If you need, you can trim the video length, crop the video frame, and merge video segments.